Includes The Practice Text Extending Throughout Space for the Benefit of Beings by Tangtong Gyalpo and The Commentary Continual Rain for the Benefit of Beings by Khakhyab Dorjé, the 15th Karmapa. Practice Text is presented in Tibetan, English Transliteration and in English. Commentary is presented in English. "As one of the Buddha Shakyamuni's eight close disciples, Chenrezig— Avalokiteshvara in Sanskrit— was present when the Buddha gave teachings on the Bodhisattvayana. The meditation-recitation of four-armed Chenrezig given here is a particularly effective practice method for human beings. Its lineage originates with the 15th century Tibetan mahasiddha Tangtong Gyalpo, who was Chenrezig himself in human form. It belongs to the "gom-loung" class, meaning that we may engage in the practice without having first received an empowerment. 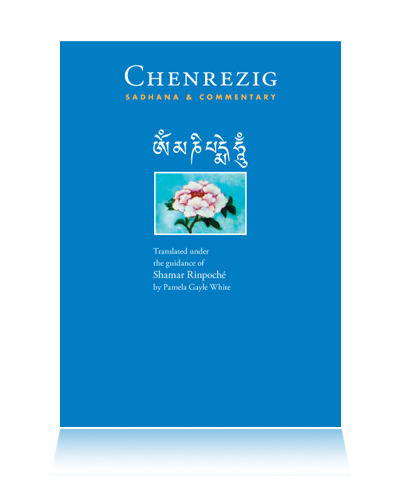 Though it is quite accessible and easy to follow, this concise form of the Chenrezig meditation-recitation can ultimately lead to the same deep realization and results as far more elaborate Chenrezig practices." © Bodhi Path 2012 | email: store@bodipath.org | +1-540-228-0280 | Designed by Mariner Media Inc.